Saint Barbara, a Virgin Martyr, is the patron saint of firefighters, soldiers, prisoners, stone masons, those who have dangerous professions, construction workers, builders, mathematicians, and the city of Santa Barbara, California. She died by the sword, but her killers were struck down by lightning, so she is often called on for protection from lightning and for protection from violent and unpredictable death. She is one of the Fourteen Holy Helpers. Her feast day is December 4th. Saint Barbara, whose name means "barbarian woman," lived during the late 3rd and early 4th centuries in Nicomedia, Bithynia, Asia Minor. According to legend, her pagan father, Dioscorus, kept her locked in a tower to preserve her virginity. She spent years in the tower hauling her food and laundry up and down by means of a basket on a rope. One day a stranger slipped a book about Christianity into her basket, and, upon reading it, she feigned sickness and sent for a doctor. The man who arrived was a priest, who secretly baptized her. When her father finally found a suitable husband for Barbara, she admitted to being a Christian and refused the marriage. She escaped from the tower and hid out among some shepherds, but was re-captured. The prefect of the province, Martinianus, also called the procounsel Marcian, ordered her to be paraded naked though the town. A fog came up suddenly and hid her from the crowd. He then ordered her to be tortured with the flames from burning torches, and condemned to death. The torches did not burn her, so on December 4th, 306, her father carried out the death sentence by beheading her. On his way home, he was miraculously struck by lightning and killed, in what appeared to be an act of divine retribution. Because there have been doubts about the historical accuracy of this story, Saint Barbara was removed from the Catholic liturgical calendar in 1969. However, like Saint Christopher and Saint Expedite, who were similarly "de-sainted" at the same time, her popularity continues unabated. The iconography of Saint Barbara generally shows her dressed in white and red. The sky may be dark and foggy, with jagged flashes of lightning above. Often the tower in which she was kept captive is depicted the background, but in some images, she holds a small model of a tower in her hands or wears a crown which mimics the crenelated top of a stone fortress-tower. 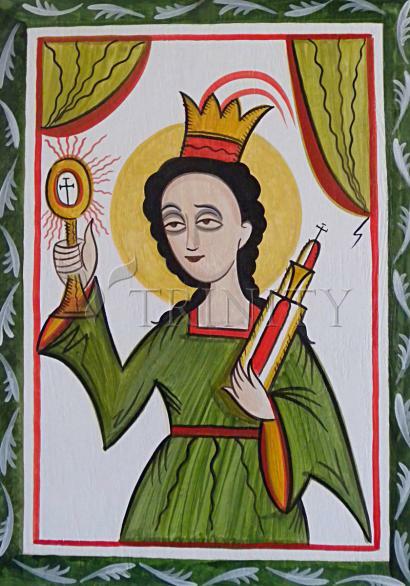 In addition to the tower, images associated with Saint Barbara include the sword with which she was beheaded, a chalice, the palm branch of her martyrdom, and the lilies of virginity, A little plant bearing white daisy-like flowers -- either Feverfew or Life Everlasting -- often blooms at her feet. In Syria, Lebanon and Palestine, among Arab Christians, Saint Barbara's Day is often celebrated with offerings of white barley and red pomegranate seeds, sweetened with raisins, anise, and sugar.